When I was a little girl, the grandmother of a neighborhood playmate became dismayed when I turned down her offer of boiled spinach with the words, “No, thank you, ma’am”. “A proper and polite refusal always begins with ‘thank you’, followed by ‘no’,” she instructed. I had to eat the spinach anyway because she was that kind of granny. I remember a couple of years ago, I bought whisky-filled chocolates as a gift for my husband. So I went in search of those chocolates recently, thinking I’d give him a non-birthday, non-holiday surprise. Godiva used to sell whisky-filled chocolates, but not only did they discontinue those products in their Geneva store (the city closest to us), they also discontinued the Geneva store itself. Too bad, but there are plenty of other chocolate makers and suppliers in Geneva. So far, however, I’ve come up almost empty-handed. There are truffles with whisky, but that’s not the object of my desire. I am looking for dark chocolate bars or cubes, each with a pocket of whisky inside.There must be some sort of bottleneck in the whisky-for-chocolate supply chain, because the whisky version of various chocolate manufacturers is the only version not in current alcohol-filled chocolate lines. If I wanted cognac, eau-de-vie, schnapps, absinthe, vodka or even Red Bull (not alcohol, I know, but I saw it on a shelf yesterday), I’d be dazzled by my options. As it was, I bought the Jack Daniels bar shown here. And I am very sorry to report that it did not get very positive reviews. The chocolate was a bit bland, the whisk(e)y raw and runny, the texture a bit waxy. For the time being, we’ll be sticking to the tried and true method of eating a piece of excellent chocolate alongside a glass of excellent whisky. 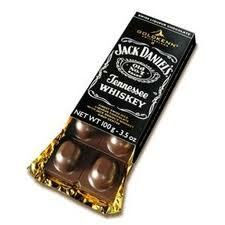 As for the rest of the Jack Daniels chocolate bar: Thank you, no. I had been thinking about trying the J.D. bar. But now I know just go for the good, dark Lindt and take a drink alongside! I’m sure other people might feel differently about the JD – it’s just not my dram of whisky, that’s all. There’s a Villars chocolate with whisky that’s wonderful – some day I’m sure it will be back on the shelves.